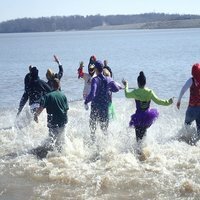 The Polar Plunge, presented by Law Enforcement Torch Run and GEICO, is a unique opportunity to support Special Olympics athletes by taking a flying leap – a leap into the frigid waters of Carlyle Lake. Participants must raise $100 in donations from friends, family and co-workers in exchange for jumping into the icy waters. Anyone can plunge — young & old. All plungers must sign a waiver and plungers under the age of 18 MUST have a parent/guardian sign the waiver form. Attire: Anything but a wet suit; shoes are required; costumes encouraged. The Polar Donut Dash 5K will be held in conjunction with the Carlyle Polar Plunge. This is the only 5K around that not only tests your speed but your ability to eat donuts! Participants will be treated to multiple donut stops along the route and will receive a minute deduction from their overall time for each donut they consume along the course. Awards will be given to the top three individuals in each age category. Plungers will receive incentive prizes based on the amount of money they raise. By raising the minimum of $100, you’ll receive an official Plunge hooded sweatshirt. Other prizes are awarded at the $250, $500 and $1,000 levels. 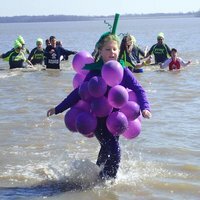 The dash and plunge will take place Saturday, February 23 at Carlyle Lake’s Main Beach located at 801 Lake Rd., Carlyle, IL. Donut Dash registration starts at 8 am and the dash starts at 9:30 am. Plunge registration starts at 10 am with the plunge taking place at noon.